The unaffordable thing in this digital world is the security of the data. The computer data is more valuable than anything in this world, and thus, it is essential to protect them. One may afford to change the software, hardware or the entire computer but not the hard disk and the data in it. Also, it is inevitable to provide 100% protection to the information that we stored on computers. Even though the technology is evolving in a rapid manner, it is hard to get a good software/ hardware to defend our records on the disk. However, any deleted or accidentally data stored should be able to recover flawlessly. How To Recover Deleted or Formatted Data? Novices believe that the data once deleted or formatted cannot be getting back; it is just a myth. All we need is a good software program that stirs the file system for the lost data safely by not disturbing the existed files and recovers them on to the specified locations. On such dynamic software is EaseUS data recovery program. It is simple and elegant software that pick up the lost data in short time. It gives control to the user to take care of the recovery process sorted by size, type and number of files from the specified partitions including USB data recovery and any external devices connected. Let’s get to know more about the data recovery with the help of EaseUS data recovery software. The following procedures and methods are as options given in that specific software. You may or may not find such an easy opportunities in other recovery software programs. So, I recommend you to go with the EaseUS Data Recovery Wizard for Mac and Windows as well. Just follow the below guidelines to use it! Step 1: Visit EaseUS data recovery site and download the right version of the software for your computer operating system. Step 2: After downloading, run the setup file and go with the installation procedure that will work in a smooth manner. 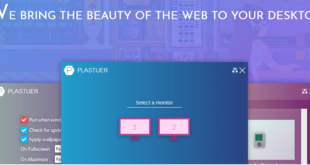 You don’t need to have any professional experience in installing this program. 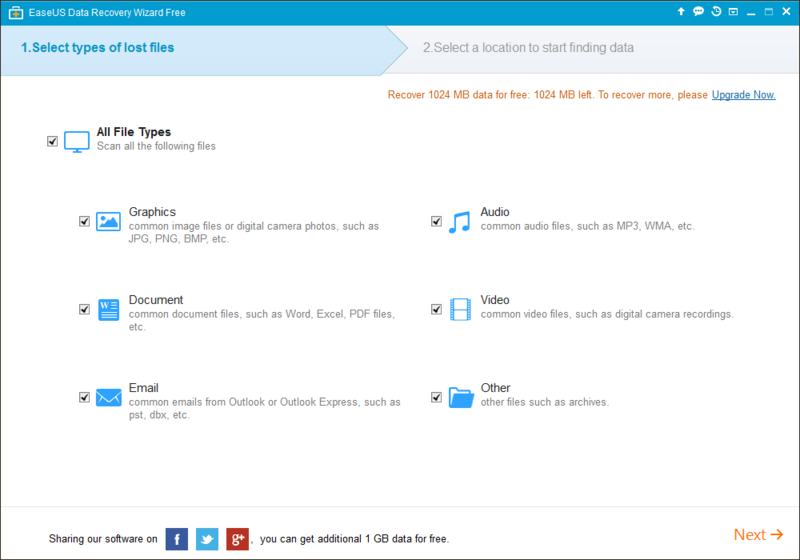 The home screen will allow the user to choose the file type to search. You can select to recover graphic file types such as JPG, PNG, BMP and other image file types, audio file types such as MP3 WMA, video file types such as standard video files and digital camera raw files, emails, documents and archive files. Option to choose all the file types with one check is available and you can see that in the above screenshot. Step 2: The second step involves the selection of the partition or disk location to recover data from. This screen shows up the connected external drives also, which is a feature of an ideal recovery software program. Select the location and click on ‘Scan’ button. 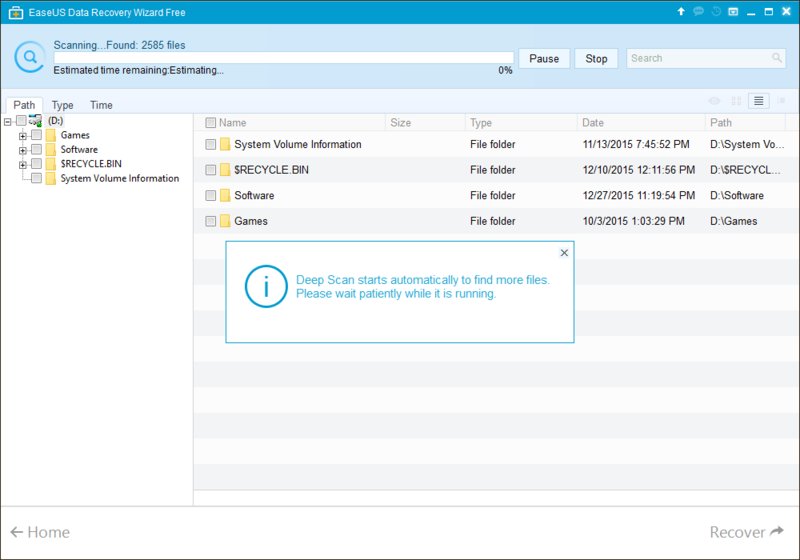 Step 3: EaseUS data recovery software will look for the deleted files, folders and shows up as a list. Select the files and folders that you want to recover and click on ‘Recover’ button. A tree of the file system will be shown in the left pane with the recoverable files and folders in the right pane. Step 4: If you don’t find your files in the standard scan, switch over to ‘Deep Scan’ and scan for the deleted files much efficiently. 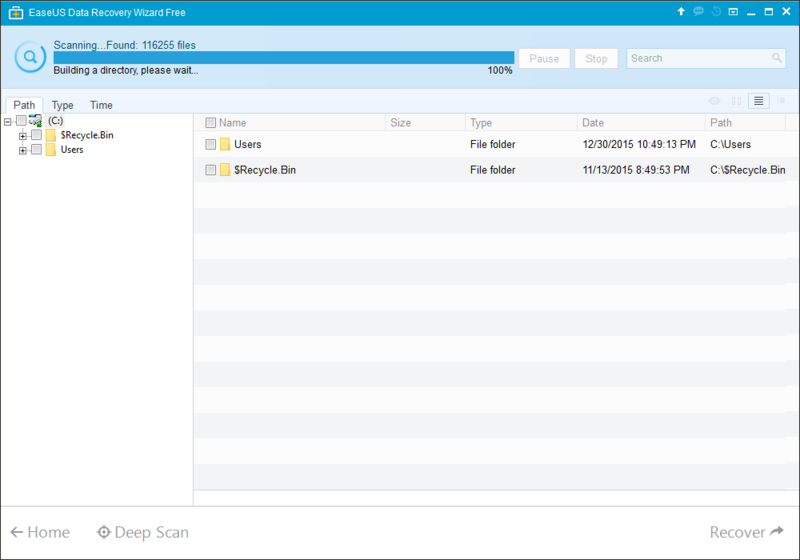 This ‘Deep Scan’ option gives control of sorting the results by file type, size, and time that makes the recovery more accurate. EaseUS specializes in recovering the high-performance RAID data disks. The data on the stack of multiple disks is recovered flawlessly using this data recovery software. EaseUS Data Recovery Wizard works on Windows 2000, XP, 2003, Vista, 7, 8, 8.1 and 10 versions without any issues. Checkout their tutorial on how the RAID recovery is done in the systematic process. USBs are indeed the most needed and risky storage devices with the highest probability of data deletion. As they often plugged into the computer to computer, the chances of data to get affected with viruses are more than compared to the hard disks. So, recovering the data from them would be a challenge. 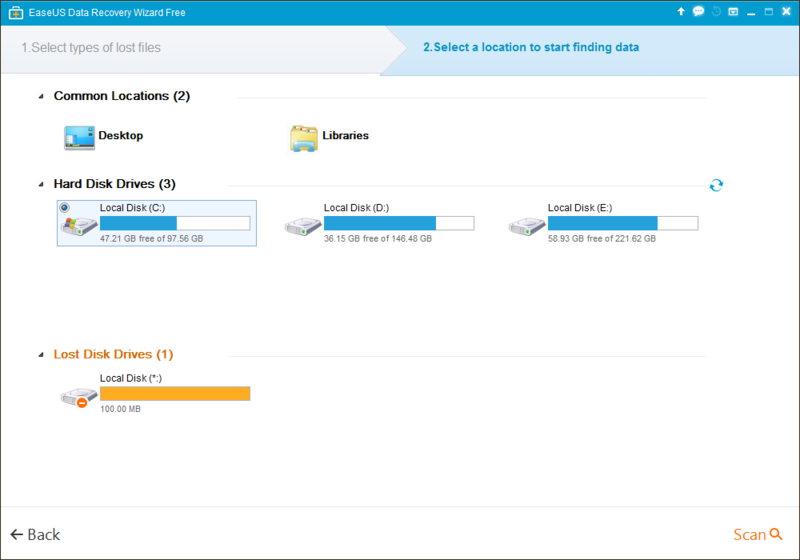 With EaseUS Data Recovery Wizard, it is very easy to retrieve the data from a flash/pen drive just within few clicks. You would also want to look at this simple, complete USB data recovery procedure by EaseUS. Invalid media type reading the drive. Abort, Retry, Fail? Are there any other annoying errors than these? I guess no. 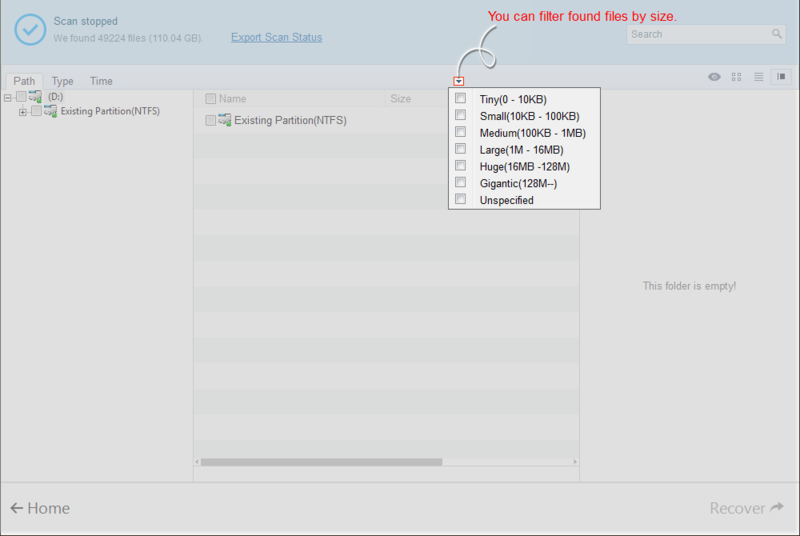 EaseUS Data Recovery Wizard helps you recover or solve even these types of error disks. It provides the full recovery guide for raw partition recovery process so that you can do it an easy manner. As we already discussed in the beginning, data is invaluable. Don’t let it go away with your notice. Always take backup of the important data on your computer to external disks and on to cloud spaces. A secondary backup is always recommended for data safety. No software can completely recover the lost data, but the EaseUS just tries to fetch the lost data at the best. Good luck!